Improve your memory and ability to retain and recall information, facts, figures, places and dates, by boosting your alpha brainwave activity. 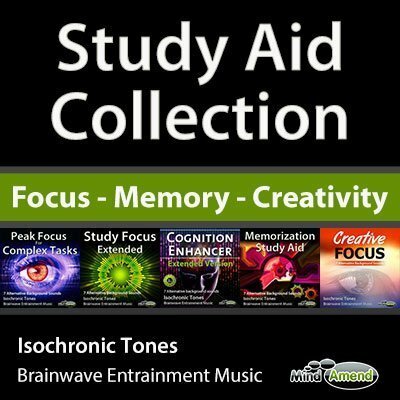 This extended 3-hour track is specifically designed for memorizing information over a longer study period. Once you have mastered and understood the material you are learning, you can help improve your ability to memorize and recall that information, by revising and absorbing it while in a heightened Alpha state. How does the track work? The track stimulates your brainwaves to increase the activity of the 10.2 Hz frequency in Alpha. Beta is the frequency range you would normally be experiencing while awake and alert during the daytime, and Alpha is a more relaxed state just below that. When you are in an Alpha mental state you become and feel more relaxed. It is theorized that while in this relaxed state, you gain a more direct route to your subconscious mind, where your brain stores and files information for recall later on. This session is based on a memory recognition study in 2006 by Jonathan Williams, Deepa Ramaswamy and Abderrahim Oulhaj. The study participants were stimulated with a range of different Alpha frequencies. The results peaked at the 10.2 Hz frequency, where participants outperformed the control group in memory recognition by 15%. This isochronic tones session begins beating at 10.2Hz in Alpha, where it holds for 6 minutes. It then ramps up sharply to 12Hz at the bottom of Beta, where it holds for 2 minutes, before ramping back down to 10.2Hz again and repeating the cycle. The main focus of the track is on boosting your Alpha brainwave activity, but I've also included periodic short bursts of low Beta stimulation, to help keep your concentration levels up and prevent you from getting too relaxed and drifting off. How the Memorization Study Aid frequencies are structured. Click to enlarge. In addition to the relaxing, tranquil soundscapes, I've also included a couple of more upbeat tracks to give you some variety. Listen to this track with your eyes open while reading and studying. This track is suitable for listening to at any time during the day or evening, but it is not designed for use while you are asleep. It's important to maintain a good level of hydration, especially when doing mental activities which require a high level of concentration, as your brain needs water to function well. So I'd recommend drinking some water before you listen to this, and have a some on hand if you are planning to use it for the full 3 hours. Headphones are not required – This session stimulates each ear with the same frequency so you don't need to wear headphones for it to be effective. However, wearing headphones will often make the stimulation feel more intense and help to cut out distracting external sounds, which can be particularly helpful when studying in a noisy area. So try listening to it both with and without headphones and see what works best for you. If you do decide to wear headphones, most normal headphones will do, as you don’t need anything top of the range for it to work. However, if you do use better quality headphones with deeper bass, you'll probably find that the sound of the tones/beats is more distinct and clearer to hear, which can improve the stimulation effect to some extent. 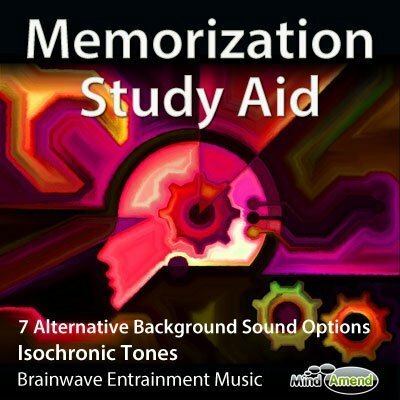 Memorization Study Aid is also available as part of the Study Aid Collection, which offers a package deal saving of 40% off.